Welcome to the Earlysville Exchange! We are a non-profit community enterprise operating under the guidance and supervision of Chestnut Grove Baptist Church. 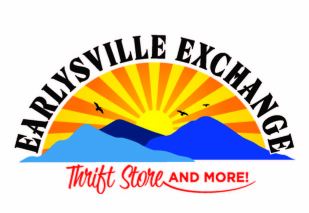 The Earlysville Exchange is anchored by a thrift store and coffee area with free Wi-Fi. or shop for gently used clothing and household treasures in our Thrift Store. If you'd enjoy volunteering, please contact us! Everyone is welcome. Our mission is to provide a community venue to exchange possessions, time, gifts, talents, and friendship for the direct blessing of our Earlysville neighbors, as well as all the families of the earth. check it out & enjoy a cup of coffee!